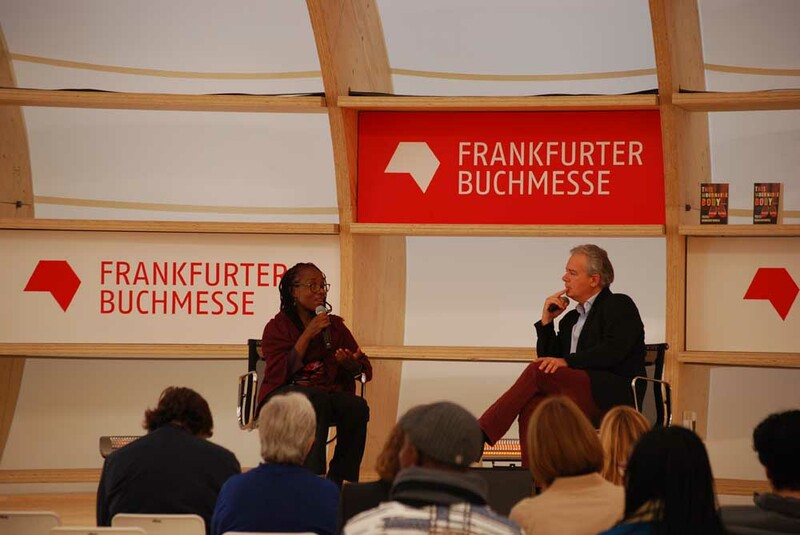 One of the most anticipated panels in Frankfurt Book Fair with an African focus had to have been the pavilion event featuring Tsitsi Dangarembga being engaged by Ilija Trojanow. Tsitsi Dangarembga is the author of the trilogy Nervous Conditions (1988), The Book of Not (2006), and This Mournable Body (2018). Trojanow is the author of Meine Olympiade (2016), The Lamentations of Zeno (2011), The Collector of Worlds (2006) amongst many others. He had done the German translation of Nervous Conditions thus could comfortably lead the discussion. How former colonisers are claiming victim status. Tsitsi referenced Trevor Noah’s (Behind The Scenes) where the powerful in society were now weaponising victimhood. She then explained that the same applied in Africa as many of those who were once oppressors have found a way to become the victims. This is spite of their making life very unpleasant for Africans a few short years ago (our paraphrasing). On the books that she was writing. Her books were referencing a hopelessness that was evident not just in Africa but in the USA with Trump, in Turkey and throughout the world. On the Africa Book Fair which she will be curating next year. She feels that the festival was long overdue as the best way for people to get to know one another was to get to know their stories. On the writers she will be inviting there has been a revolution for the younger generation of writers but she wouldn’t only be focused on them. She would also be picking writers whose voices were strong. The Internet means that there are new ideas from the youth including writing dystopia which is good. The caveat here is that Zimbabwe is 70% rural and we need to debate with this majority at the grassroots. On how their art work is affected by politics. Political repression is having an effect on storytelling at every level. It is difficult for instance for people to meet which is important for storytelling to happen. On the effects of outside support for artists. While grants and government support works, neither are a recipe for creativity by artists. On whether we can expect a German language translation of This Mournable Body. She has a publisher for South Africa at the moment but she is not sure of what other translations could be in the offing as this is not in her hands. The image in this post was supplied by our good friends at interkontinental.